Ukrainian President Viktor Yushchenko pledged Friday that this ex-Soviet republic will join the World Trade Organization by November. "It is a challenge for our economy. 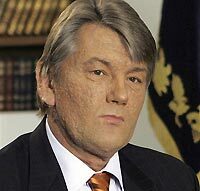 By November we will join the WTO," said Yushchenko. Yushchenko said membership in the group that sets trade rules will allow Ukraine to join a free trade zone with the European Union and help increase annual economic growth by 2 to 4 percentage points. Yushchenko has made joining the WTO a priority for Ukraine, which needs foreign investment to boost its economy. Parliament last week passed all the laws needed to meet the 150-nation organization's admission requirements. Socialists and Communists, who now are in the ruling parliamentary coalition, have opposed some of the measures, fearing the impoverished work force could suffer by aggressively opening the country up to foreign trade and WTO standards.